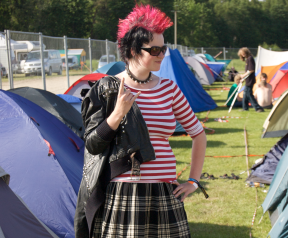 I was last week end at the biggest rock festival of Estonia, Rabarock, for the very first time. After having experienced many festivals in Finland, I was curious and refreshed to visit one here in Estonia. Maybe the band list was not so impressive as usually can be in the biggest Finnish bands, but there were interesting artists visiting, like the English The Wildhearts or the American Anthrax. There were better and worse things than in Finnish festivals. Opposite to for example Provinssirock, people cannot enter with any alcoholic drink, and even for me, being a journalist, I still had to wait for the queue like anybody else. The freedom of movement was quite limited, although we had access to the VIP bar at the backstage (meaning cleaner toilets and… more expensive coffee than outside…). But the food and drinks had quite a decent price in the different kiosks spattered around the festival area, and I also liked that it was not so crowded and people could more quite freely around or reach the first rows in the concerts without having to kill anybody. Same than in Finland, the audience was maybe a little bit cold and shy, but although of course people spent all the night talking and screaming in the camping area, I did not see such a general abuse of alcohol by most of the audience like usually happens in Finland (of course with exceptions of people totally wasted and singing at 10:00 on Saturday morning). I had the chance to meet interesting people at the backstage and also research for a future article I am writing as freelancer about Estonian music scene. I talked to “Uncle Bella”, a legendary musician and DJ, one of the first punk rockers in Estonia, and also could chat and take some pictures together with the beautiful Piret and Lenna of Vanilla Ninja (I totally had to improvise the questions for them) or have fun trying to understand the mix of Estonian and English language during the interview with Estonian depressive rock band Kosmikud. The best thing was to interview Ginger, the singer of The Wildhearts. He turned to be a super friendly and cool guy, and if it would have not been for the rigid organization that did not let me stay longer, we could have been talking and drinking beer for hours after the interview. A great musician and very cool talkative guy! The rain hit the festival strongly during the second day, Saturday, and I was lacking energy, hours of sleep and a better raincoat to stay until the end. So we decided to leave the festival before Anthax concert. A pity, it would have been nice to see them and maybe interview them, but still, the feeling was quite positive in general. With a couple more of big international bands, and little improvements in the organization, this festival could be one of the nicest ones to enjoy in North Europe. Let’s see if I can come back next year to experience it again!